We are storytellers. When you buy a watch, you are seduced by a story. 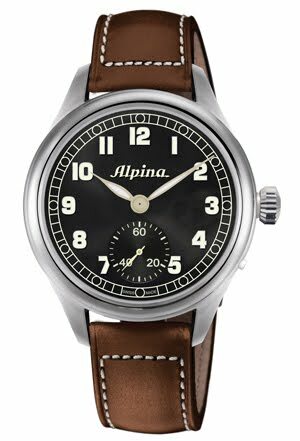 The Alpina Heritage Pilot is the story about Alpina’s history as a specialized manufacturer and official supplier of military and pilot watches. Inspired by original Alpina Pilot watch designs from the 1920’s and 30’s, we are proud to introduce this reedition. Design details of the Alpina Heritage Pilot closely match the original timepiece from the Alpina archives, the handwound pocket watch caliber, the hinged case, as well as the Alpina applied brand logo and indexes on the dial. At the same time, certain technical specifications have been upgraded to today’s watchmaking standards. For example, the accuracy of the caliber is improved and the case is manufactured in stainless steel for improved durability. The caliber can be seen once the hinged cover is opened on the backside of the watch. The movement is protected by an additional curved glass to also ensure water resistancy, even when the hinged back is opened. The Alpina Heritage Pilot is offered in a limited edition of 1883 pieces, a number that was choosen as it matches the foundation year of Union Hologere, the company that registered the Alpina brandname in 1901. The story of Alpina starts at the end of the 19th Century when Gottlieb Hauser founded the Swiss Watchmakers Corporation with other independent watchmakers of the region. Initially it was to purchase watch components and making own calibres. Very soon Alpina was being sold internationally and at the height Alpina had nearly 2000 outlets all over the world, an exceptional figure for those days. It is no exaggeration to say that Alpina was one of Europe’s leading watchmakers. Part of the reason for this success, other than the rigorous dedication to design and quality, (values that still hold true today), was the introduction in 1938 of the Alpina 4. The number ‘4’ stood for the 4 core principles that each watch in the series had to have: anti-magnetism, water-resistance, anti-shock and in a stainless steel case. These principles gave a theme to the watches and can be said to have pointed the way to the development of what was to be the continued success of the company up until the 1970s. It was the so-called ‘Quartz Crisis’ that either sounded the death knell for many companies or meant the creation of major groups. The emergence of cheap, mass-produced and, above-all, impersonal, watches also nearly meant the end for Alpina. However, despite everything, Alpina hang tough and was revitalized in 2002 and the comeback was on. Working round the clock, a new collection was made ready for the BaselWorld show in 2003. In 2006, Alpina made one more move in its journey towards the future when we moved to a new, purpose built manufacturing site in Geneva, Switzerland, one of the spiritual homes of watch making. Limited edition of 1883 pieces, birth year of the brand. Delivered into a wooden and aluminium vintage gift box. Black mat dial, and hand-applied luminous numerals.